He has performed with various artists both in Europe and the US, playing north Indian classical, Bhajan and Kirtan devotional and light classical singing. He has also participated in various world music and jazz projects. Daniel moved from Vienna, Austria to Arizona in 1992 and started teaching in AZ 10 years ago. In 2010 Abhijit made Daniel and official teacher of the the Dhwani Academy. 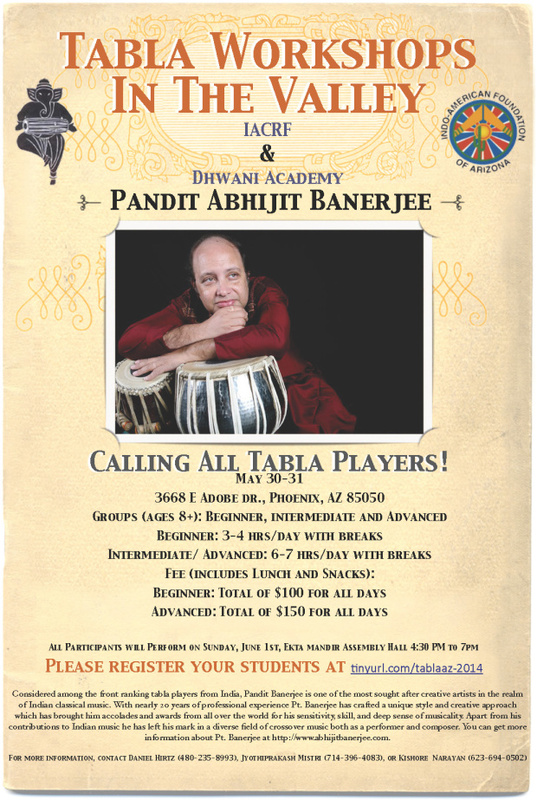 DHWANI ACADEMY FOR PERCUSSION MUSIC IS NOW OPEN IN PHOENIX! Dhwani Academy USA, a non-profit 501.c3 corporation incorporated in California, is founded with an aim of propagating Indian Music with a special emphasis on percussion and rhythms of India. Dhwani now has more than 80 regular students in different centers that it operates and its main office is situated in Corona, CA. Dhwani has six major chapters in the Los Angeles, San Diego, New York and now also in Phoenix, AZ. Dhwani operates regular classes in these places and Daniel Hirtz, a senior disciple of Abhijit Banerjee has officially approved to join the Dhwani faculty and takes care of the students in the Phoenix area throughout the year. The principal Abhijit Banerjee himself spends almost 4-5 months in California. He now will come to Phoenix on a regular basis to spend time and give attention to each and every student personally. No matter what your goals are, I will help you or your child to first develop clarity of sound, a solid sense of time, and a good understanding of rhythmic cycles. We also will spend time on how to practice to help you develop your skills quickly while enjoying it. Daniel teaches the Dhwani Academy curriculum under the supervision of Abhijit Banerjee. Students register with the academy and will receive regular evaluations and certificates of accomplishments from senior faculty. Students also are encouraged to perform at Dhwani yearly events to apply what they learned in actual performance. Contact me at daniel(at)BreatheForPeace.org to schedule classes. I teach at my house near Cactus Rd. and 64th St. on the border of Scottsdale and Phoenix. For the past 9 years, I have been fortunate enough to not only learn tabla from Daniel, but also grow our friendship. Daniel is an amazing student of tabla himself and has been kind enough to pass on to me some of the knowledge he has accumulated over his 25+ years with tabla. Every Sunday I look forward to my classes with Daniel. Whether he is teaching me Djembe or Tabla, Daniel gives me his undivided attention, allowing me to flourish under his guidance. Daniel’s determination to succeed at various percussion techniques has rubbed off on me and I am looking forward to learning more and more under his tutelage! Thank you Ved 🙂 It has been a long time and a lot of fun to see you grow up. Keep up the good work! It started with my son attending the first class of his Daniel Sir around the middle of 2013. What struck me initially was that not only he is fantastic as a teacher, but he has tremendous knowledge and keen interest in going to the very depths of various aspects of Indian Classical music. My son really started improving. He had had some exposure as a beginner in India before, but believe me from the first day we knew this was a way better experience from day 1. Primary reason for this improvement, was that Daniel Sir was always working on improving on the minutest of details and has an endless supply of patience regarding his students repeating mistakes. Not all students can put in 3-4 hours of practice every day and hence they will come back week after week with less than perfect practice and remembrance. You need a teacher like Daniel who would be willing to spend his energy to go over the tricks of the trade again and again, till you get it! Interesting Note, but probably it says it all> I used to sit and watch my son taking the lessons, out of my own keen interest in this form of music. Then I myself joined his classes as well. Take that! At the age of 37, I was willing to start to play the catching game to my son (still trying to catch him!)! It was all because of Daniel and his great lessons, the sound of music just resonated. When I was growing up, classical music was omnipresent in my household. But still due to my own lethargy and inertia, I was not inspired enough. It is testimony to how inspiring Daniel’s classes can be, I just could n’t resist diving in! Funny Anecdote: My father is an avid Indian classical enthusiast and used to be a tabla player himself in his youth. When they visited us in USA, a short while back, he was amazed and highly impressed to see a “Gora” guy imparting Indian classical lessons to both his son and grandson :). I can tell you he is extremely happy about this whole series of events. ALL credit to Daniel! Thank you so much Siraj! I am humbled by your feedback and I promise to do my best not only in teaching you everything you know but to keep expanding my knowledge and to keep practicing! I’ve been practicing with Daniel for almost two years. I love his enthusiasm for teaching and music. He does a great job at making each lesson unique and fun. It has been a wonderful experience gaining insight into music from someone with such a wealth of musical knowledge and talent. I’ve had a lot of fun playing with him over these two years and I look forward to many more jam sessions in the future! Yes, it has been fun Josh! Thanks for your feedback! I have been a student of Daniel’s for 7 years now, and in those 7 years I have learned so much about drumming. Daniels own love for music has helped me greatly develop my own. He has taught me not only tabla but also various world percussion instruments like djembe. Daniel’s classes are always fun, but also build up musical ability. Overall, Daniel has really opened my eyes to music and is a wonderful mentor and teacher. Thanks Saaketh, I really appreciate your kind and well chosen words 🙂 I’m looking forward to many more classes and performances with you! Thank you Shyam, it has been a lot of fun to have you as my student… I’m looking forward to continue to jam with you!